Jane guides harp students of all ages and levels to play the music they long to play, develop essential techniques and skills, and to have fun and satisfaction along the journey with what is truly a magical instrument. Lessons are available in person or distance via Skype. Folk harp Magic (Foundations) – If you’ve never played the harp, or are returning to the harp after a long break, Jane will help you ground in essential techniques and engaging practices for playing the harp in ways that allow you to experience and express the musical heart of the harp. Jane loves teaching beginners! The Winged Harp (Creative Expression) – For advanced beginner and beyond, where we focus on your creative expression and more advanced techniques. Arranging, composition, improvisation, playing for others, musical styles, ornamentation, bass hand or two-handed patterns, modes, rhythms and polyrhythms … We draw from the spread of musical traditions and cultivate particular skills to help you create your unique music. 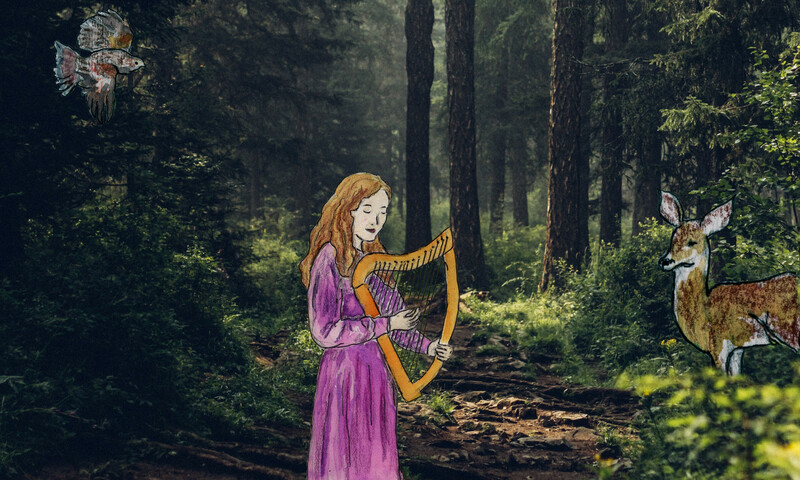 Dragonharper (Bardic harp) – That is, harp with story, song, and poetry, with the intention of bringing the listener into the true magic of the world. Folklore, myth, history, ancestral wisdom ways, nature, imagination, and a sense of wonder and mystery are part of this terrain. 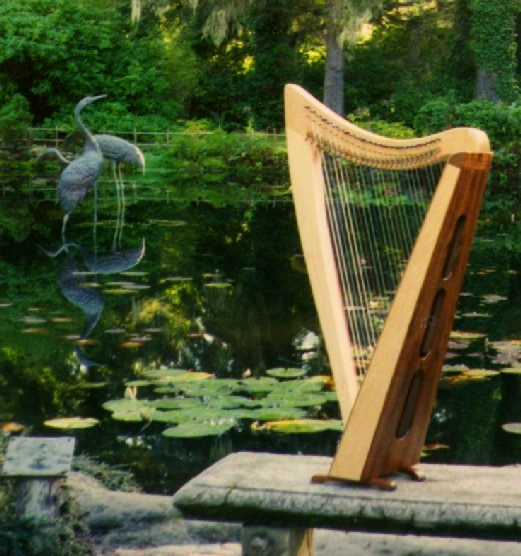 “When Harpers Once in Wooden Halls” – Wire-strung (ancient Gaelic) Harp – With its metal strings, this rare harp has beautiful bell-like tones and a rich legacy. Jane draws on traditional Celtic streams and on contemporary wire-strung technique and expression in teaching this exquisite instrument. Harper of the Paper Crane (Harp for Healing and Contemplation) – in which we cultivate our skills with the harp to touch the heart, nourish peace of mind, and help bring body and soul into harmony. Depending on the student’s interest, we can focus on therapeutic harp skill development, enter more fully into the realm of sound and energy healing, or focus on harp playing for one’s own contemplative practice. Harp Lessons for Children – Jane loves working with children! She teaches the Celtic/folk harp to children age 7 and up. Lessons are 1/2 hour, and involve play, whole body movement, and imagination. Jane teaches by ear, with learning to read music coming in after the child is well-established with playing the harp. Kinder Harp/Pentatonic Lyre – In Waldorf education and other circles, the kinder harp/pentatonic lyre is a lovely, calming instrument for the young child (and their families! )- serving in its own right as both a sweet introduction to music-making as well as to the harp. With the kinder harp, you can accompany song or storytelling, improvise music that sounds pleasing no matter what you do, and even play tunes. Jane offers 1/2 hour parent-child lessons, or 1/2 hour to 1 hour-long lessons for the parent, educator, or caregiver seeking to guide a child in playing the kinder harp. Lessons are intended to help the parent gently model the possibilities of the lyre, and – with attentive curiosity and playful engagement – to help the child discover different ways to create music. Kinder harp lessons can be a single lesson, several, or longer term. Styles & Skills: folk, Celtic, world; contemplative & therapeutic harp techniques; arranging & composition, improvisation, performance, ornamentation, modal music theory and application, harp & storytelling techniques, singing with the harp, and more. Rental harps: Nylon-strung Celtic harps. Inquire about availability. Jane has performed and taught the Celtic harp since 1988. She has several harp recordings. Read her full bio here.